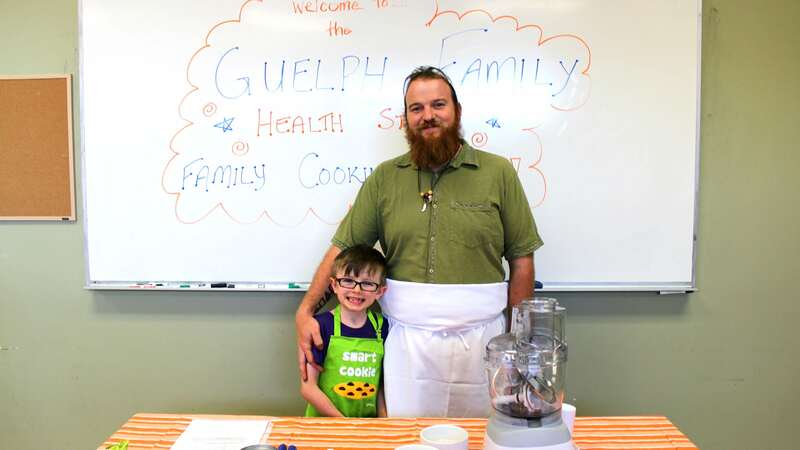 Families prepared and tasted some of the new recipes with the Guelph Family Health Study. Providing nutritious, easy and delicious snacking ideas for families is the intent of the Guelph Family Health Study with the release of their newest cookbook Snack Healthy, Snack Happy. The cookbook, which is available online, features recipes that prioritize ingredients kids might not be getting enough of, such as fibre, fruits, vegetables, dairy and omega-3 fats. The Tuna Arancini recipe, for example, makes small balls of red pepper, tuna, brown rice and cheese, and provides kids with a source of omega-3 fats from the fish. The cookbook is supplemented with four instructional videos that demonstrate step-by-step how to prepare some of the snacks. Guelph Family Healthy Study is a long-term study that works with families over many years to learn about their eating, exercising and sleep habits. As part of the study, researchers provide scientifically-backed health advice to the families. Families participating in the study expressed a desire for better access to healthy snacks for their kids, and Snack Healthy, Snack Happy is a response to this need. The cookbook was created in partnership with George Brown College’s Food Innovation and Research Studio, and sponsorship was provided by the Helderleigh Foundation. Guelph Family Health Study is also launching another source of health advice for families. Healthy Habits, Happy Homes is a weekly podcast hosted by the research team that gives evidence-based tips and tools to help families develop healthy home routines.